Syria’s chemical weapons facilities are “inoperable,” the Joint Mission of the Organisation for the Prohibition of Chemical Weapons (OPCW) and the United Nations overseeing the destruction of the country’s weapons programme confirmed today. “The Joint Mission is now satisfied that it has verified – and seen destroyed – all of Syria’s declared critical production and mixing/filling equipment,” according to a statement released by the joint OPCW-UN team. “No further inspection activities are currently planned,” it added. The Mission confirmed that Syria has met the deadline set by the agency to “complete as soon as possible and in any case not later than 1 November 2013, the destruction of chemical weapons production and mixing/filling equipment”. 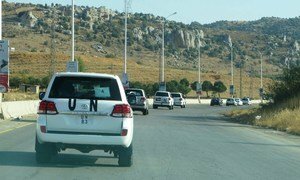 The Joint OPCW-UN Mission has inspected 21 of the 23 sites declared by Syria, and 39 of the 41 facilities located at those sites. The two remaining sites were not visited due to safety and security concerns, according to the statement. Damascus declared those sites “abandoned”, the agency said, and the chemical weapons programme items they contained were moved to other declared sites, which were inspected. Eight of the OPCW inspectors who had participated in the process today returned to The Hague, after nearly a month a Damascus. The next milestone for the Joint Mission will be 15 November, by which time the Nobel Peace Prize-winning chemical weapons watchdog must approve the plan submitted by Damascus detailing the elimination of its chemical weapons stockpile. The UN Security Council has endorsed Secretary-General Ban Ki-moon’s plan to deploy up to 100 UN and OPCW experts in a multi-phase operation to carry out its resolution on eliminating Syria’s chemical weapons material and equipment, scheduled for completion by 30 June 2014. The Council passed its resolution after Syria agreed to join the Chemical Weapons Convention following a chemical weapons attack in August that killed hundreds of people in a Damascus suburb, in a conflict that has already killed over 100,000 people and driven some 6.5 million others from their homes since protesters first sought the ouster of President Bashar al-Assad’s Government in March 2011. The Joint Mission of the Organisation for the Prohibition of Chemical Weapons (OPCW) and the United Nations dealing with Syria’s chemical weapons programme reports that it has now visited 18 of the sites disclosed by Damascus, a spokesperson for the chemical watchdog said today.